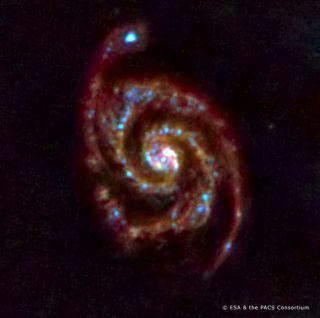 Three-colour far-infrared image of M51, the 'whirlpool galaxy.' Glowing light from clouds of dust and gas around and between the stars is visible clearly. These clouds are a reservoir of raw material for ongoing star formation in this galaxy. TheEuropean Space Agency's Herschel telescope is up and running, with its firstobservations revealing water and carbon as well as dozens of distant galaxies. The newspace telescope, which launched on May 14 with its sibling Planck, has nowcarried out its first test observations with all of its instruments. Herschel isthe largest, mostpowerful infrared telescope ever launched into space. Its observations inthe far-infrared to sub-millimeter wavelengths of light will allow astronomersto study some of the coldest objects in space, not visible in other wavelengths. WhileHerschel was making its test observations, Planck cooledits instruments down to their operational temperature of minus 459.49degrees Fahrenheit (minus 273.05 Celsius). This temperature is just 0.1 Celsiusabove absolute zero, the coldest temperature theoretically possible in ouruniverse. On June 24,Herschel?s Spectral and Photometric Imaging Receiver (SPIRE) was trained on twogalaxies for its first look at the Universe. The galaxies showed upprominently, providing astronomers with their best images yet at thesewavelengths, and revealing other, more distant galaxies in the background ofthe images. Thepictures show galaxies M66 and M74 at a wavelength of 250 microns, longer thanany previous infrared space observatory, but still the shortest SPIREwavelength. SPIRE isdesigned to look at star formation in our own Milky Way galaxy and in nearbygalaxies, but it will also search for star-forming galaxies in the very distantuniverse. "Thesequick first light observations have produced dramatic results when we considerthat they were made on day one," said SPIRE Principal Investigator MattGriffin of Cardiff University of Wales. Scientistsused Herschel?s Heterodyne Instrument for the Far-Infrared (HIFI) on June 22 tolook for warm molecular gas heated by newborn massive stars in the DR21star-forming region in the constellation Cygnus, or the Swan. It works byzooming in on specific wavelengths, revealing the spectral fingerprints ofatoms and molecules and even the physical conditions of the object observed.This makes it a powerful tool to study the role of gas and dust in theformation of stars and planets and the evolution of galaxies. Herschelobserved ionized carbon, carbon monoxide, and water in DR21. The firstobservation with Herschel?s Photodetector Array Camera and Spectrometer (PACS)instrument was carried out on June 23. It targeted a dying star known as theCat?s Eye Nebula. Discovered by William Herschel in 1786, this nebula consistsof a complex shell of gas thrown off by a dying star. With thePACS spectrometer it is possible for the first time to take images in spectrallines and see how the wind from the star shapes the nebula in three dimensions. Followingthese images, Herschel is now in the performance verification phase, where theinstruments will be further tested and calibrated. This phase will last untilthe end of November, after which the mission will begin its routine sciencephase.